کلّ این کار ۳۰ ثانیه هم طول نمیکشد اما میتواند حسین را از دیپورت نجات دهد. دوستان، همرزمان، انسانهای آزاده، آزادیخواهان. مبارزه مردم ما ، چه زن و چه مرد و چه پیر و چه جوان چه در خیابانها و چه در محل کار با چاقوکشان بیت ولایت امری است روزمره. این روزمره گی‌‌ به تابع خود و در شرایط امنیتی ایران مخفی‌ شدن، فرار به خارج مرز و پناهندگی را با خود به همراه می‌آورد. حق پناهندگی و تحمیل این حق جهانشمول به کشور‌های امضا کننده منشور ۱۹۵۱ و متمم‌های آن کار ساده‌ای نبوده و در شرایط بحران اقتصادی کنونی از پیش هم دشوار تر شده است. دولت‌های غربی حد اکثر تلاش خود را میکنند که پناهجویان را به کشور‌هایشان باز گردانند و در این تلاش بارها و بکرات قانون شکنی میکنند. ایتالیا هفته پیش در دادگاه اروپا محکوم شد و سوئد بارها به دلیل نقض معاهدات خود محکوم شده است. 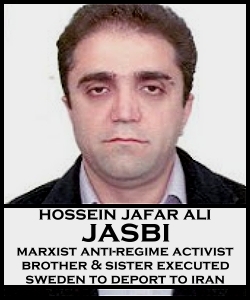 Hossein Jafar Ali Jasbi was born on 22 September 1972 to a family among the tens of thousands of families that have suffered in the hands of the “men of God” and their gallows in Evin and other slaughterhouses. By the time he was 10 years old, Hossein had lost his beloved older sister Mehri, age 27, and a brother Reza, age 25; they were among those tens of thousands executed in the 1980s. Hossein’s father, who wasn’t even politically active, was put behind bars like the hundreds of mothers, fathers, and relatives who have been arrested, jailed tortured, forced to confess to activities that they had nothing to do with, and then even put on “trial” in Islamic “courts” and sentenced to years-long imprisonment or – as in so many cases – even executed. Hosein’s father not only lost 2 children to the gallows of the keeper of Evin, but spent many years in that hell too. He was released only in 1989. It might be naïve, but we Iranians have never been entirely pessimistic about political support from the international community for our ideals of freedom, democracy, gender equality, and other progressive demands. Hossein worked towards these progressive ideals too, beginning his activities at a very early age. Influenced by the unbearable loss of two siblings, he became a link between the gallows and the outside world. In connection with Fadaeyin Minority, he contacted the families of political prisoners, collected information from the other side of “the gate,” and sent it to international and national humanitarian organizations. It is sad that sacrifices made by activists like Hossein, and the high price they paid for doing this life-saving work, did not lead to the reaction that we Iranians expected from the international community. Nevertheless, Hossein and many like him are the reason that today Geoffrey Robertson, QC, and UN war crimes judge, can give a detailed account and legal analysis of one of the most horrifying crimes against humanity since the second world war, the Prison Massacres of the 1980s in Iran (http://www.iranrights.org/english/attachments/doc_1115.pdf). Hossein was an active participant in the 2009 post-election uprising in Iran. After the arrest of a number of his comrades, he knew that it was only a matter of time before regime authorities came for him. Hossein was compelled to escape Iran in search of security; he chose Sweden as his country of safe haven. In addition to the contributions made by Hossein in the struggle against the Islamic Republic inside Iran, he has also been very active in speaking out against the regime, particularly on radio programs known to be run by opposition activists. He has given interviews with Hambastegi Radio, Chakavak Radio, Hamsafar Radio, Omid Iran Radio, Radio Ava, and Radio Shahrvand; .wav file recordings of nearly a dozen interviews are available on request. There is no question that Hossein, a politically active member of a family targeted for political executions by the Islamic Republic in Iran, will be detained, tortured, and possibly executed like his siblings. Yet the Swedish government has scheduled his deportation to Iran for 6 March 2012. We will not allow Hossein to suffer the same fate as his brother & sister. It is up to us to do all in our power to stop this crime. حسین هم مانند هزاران جوان دیگر ایرانی‌ با نفرت از رژیم تجاوز و زندان و اعدام و حجاب و با خواست سرنگونی حکومت قانون شرع ؛ حسین با خواست آزادی به خیابان آمده بود. حسین که ۲ خواهر و برادر عزیزش را هم کفتاران خمینی اعدام کرده اند چه پیش از انتخابات ۸۸ و چه بعد از آن دست از فعالیت بر علیه این جانوران بر نداشت. حسین را که اینک به سوئد پناهنده شده است می‌‌خواهند به جمهوری اسلامی دیپورت کنند. ما از تمامی انسان‌های شریف چه ایرانی و چه غیر ایرانی می‌‌خواهیم که با ارسال نامه‌ای که ما در این پست رو به وزیر مهاجرت سوئد منتشر کردهیم به این اقدام دولت سوئد اعتراض کنند. TAKE ACTION: A sample letter is provided below. Please act URGENTLY as there are only hours until Hossein’s deportation, set for TODAY, 6 March 2012. لطفا نامه زیر را کپی کرده و پس از امضا و گذاردن تاریخ با کلیک کردن روی نام و آدرس آقای وزیر و سکرتر وی که به رنگ آبی‌ در این جان لینک شده اند آن نامه اعتراضی را در پست اینترنتی ایشان بچسبانید. کلّ این کار ۳۰ ثانیه هم طول نمیکشد اما میتواند حسین را از دیپورت نجات دهد. Paste into SUBJECT line: Stop the Deportation of Jasbi, Balsi, Esfahani, and All Political Refugees to Iran! I am writing to you to demand an immediate halt to the deportation of Hossein Jafar Ali Jasbi, an Iranian asylum-seeker who has sought refuge in Sweden from persecution by the Islamic Republic of Iran (case no. 11.421.539). Hossein should be immediately released from detention and granted political asylum as is his right under international law. 1) Hossein Jafar Ali Jasbi has been visibly active organizing against the regime both inside Iran with his political party, Fedaeyin Minority, and as an activist during the 2009 post-election protests, as well as in Sweden as an individual activist speaking in broadcast forums against the regime. Anti-regime activists are usually charged by the Islamic Republic with “propagating against the regime” and “moharebeh,” which carries the death sentence in Iran. The case of Mohammad Amin Valian – sentenced to death for participating in the 2009 post-election protests (not to mention the thousands killed and raped in regime prisons during that period) underscores the threat to Hossein’s life (see: http://www.iranhumanrights.org/2010/02/valian-student-sentenced-to-death). It is obviously illegal under international law to return such an anti-regime political activist to Iran. Notably, Hossein’s sister & brother were executed by the regime. Hossein’s non-politically-active father was detained for years on no charge by the same regime. It is obvious that his family has been targeted for state-sponsored violence, and it is based on a reasonable fear of persecution that Hossein fled for his life to Sweden, seeking asylum, which is his right. Yet the Swedish government has decided to detain him in preparation for an illegal refoulement on 6 March 2012. I do not accept this. 2) The Islamic Republic considers all Iranian political asylum-seekers to be criminals, deeming their quest for asylum as propagating against the regime. The Islamic Republic has on several occasions declared and applied its intent to prosecute returned political asylum-seekers, on the basis of Article 7 of the Islamic Republic’s Penal Code. Rahim Rostami, a teenaged Kurdish asylum-seeker returned to Iran by Norway and immediately imprisoned is only one such example. Hossein Jafar Ali Jasbi has sought political asylum and therefore, under the Islamic Republic, is subject to prosecution by the regime. 3) The Migration Office’s own Director for Legal Affairs “concludes that the Iranian regime has both a strong desire and the ability to monitor its citizens in Sweden.” Hossein Jasbi’s anti-regime views have been widely disseminated via numerous different radio stations and broadcasts, including broadcasts by known opposition radio stations. Under the Migration Office’s own admission, the Islamic Republic’s monitoring of activists has required a change in policy with regard to asylum-seekers who are active against the regime while in Sweden. Both the Swedish government’s own policies and Article 94 of international refugee law (“sur place”) require that Hossein Jasbi be granted asylum in Sweden. 4) It is illegal under international law for any country including Sweden to deport a person who has a legitimate fear of persecution in their home country. It is therefore undeniably illegal under the same international law for the Swedish government to participate in the crime of deporting Hossein Jafar Ali Jasbi to Iran, where he will be detained, tortured, and likely executed if he is returned to the blood-soaked hands of the Islamic Republic. Despite this finding, the Swedish government continues to illegally attempt to deport Iranian activists like Navid Mirpourzadih, Sanan Ashrafi, Marzieh Kamangar, Mehdi Maleki, Keivan Soufastaei, and others, all of whom are clearly and undeniably at risk not only of detention and torture by the Islamic Republic of Iran, but at unquestionable risk of execution. We demand an urgent, immediate halt to Sweden’s intended illegal refoulement of Hossein Jafar Ali Jasbi, who is at clear risk of execution if returned to the Islamic Republic. We also demand the immediate release of Ali Azari Balsi (case #11 420529), an Iranian political activist detained in Sweden awaiting illegal deportation to Iran, and Mohammadreza Hamedian Esfahani (case #11 08445011), Christian convert facing 10 years in jail and 75 lashes should he be illegally returned to the hands of the Islamic Republic of Iran. Given the the Migration Office’s blatant, repeated violations of international law regarding refugee rights, risking the lives of Iranian and other asylum-seekers, we demand that Sweden must not only immediately halt the illegal deportation of Hossein Jafar Ali Jasbi, but must immediately cease all deportations to Iran. aste into SUBJECT line: Stop the Deportation of Jasbi, Balsi, Esfahani, and All Political Refugees to Iran! please do not put him in danger.His life will be in a very bad situation if you deport him.PLease please help him. Please do not deportation Hussein. I want swedish government let Hussein stay in Sweden.Iran is a hell and everybody who dare to leave Iran so he will get a chance to stay in a second country. MONsieur le MInistre,pitie si’il vous plait. Stop the Deportation of Jasbi, Balsi, Esfahani, and All Political Refugees to Iran! free Jasbi Nu Nu Nu,never diport to Iran. please do not deport Mr Jasbi NU Nu Nu to Iran. his life will be in danger. You cant even imagine what would happen to him if he gets back to Iran!! Please stop deporting him. Please do not send him to his country there would be worse than hell for him. من کامنتی گذاشتم و خواستم که در روند اخراج دروغگوهایی که خود را پناهنده سیاسی جا می زنند تعجیل کنند. متن کامنتهایم به سوئدی و انگلیسی هستند و احتمالا تاثیرگذار خواهند بود. Please help our refugees . For sake of humanity and saving the life of a man who may face death sentence in Iran, we all need to get united and let the world know about it. Stop deporting Iranian people like Hossein Jafar Ali to Iran . Free Iran and help people to change regime in Iran.